The K7J 1.4-liter engine is the result of the evolution of ExJ engines. 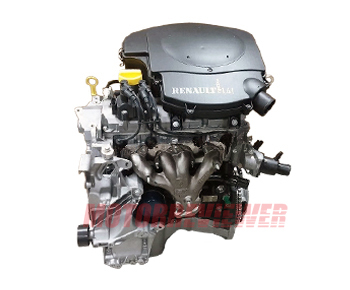 The K7J motor belongs to the K-series Renault engines. This engine has pretty old technical design from the 80s and (60s for some components). At the same time, the engine is straightforward and reliable what making it popular among using in small and cheap cars such as Renault Clio or Dacia Logan. The engine has a strong cast iron cylinder block - reliable and rebuildable. The aluminum cylinder head has two valves per cylinder and single camshaft driven by timing belt. There are no hydraulic lifters/tappets, what makes construction simple but brings some noises in the engine operation. The valve clearance adjustment is required every 20,000-30,000 km (12,000-18,000 miles). The main modern technologies are electronic multipoint injection system and electronic ignition. An old design does not allow to shine in the lights of glory among fuel consumption of harmful emissions. The small displacement, lack of power and torque - this is why the choice often falls on the 1.6-liter K7M engine. There are not any significant issues or problems with the Renault K7J 1.4- liter engine. The engine life of the reliable K7J is almost 250,000 miles (400,000 km). There are not tricky electronic systems or something, which can not be fixed by a simple man with wrench and hammer. Like other engines, it needs proper maintenance, quality fuel, good engine oil and careful driving.